Crysis is based in a fictional future where an ancient alien spacecraft has been discovered deep within the Earth. The single player campaign has the player assume the role of United States Delta Force operator Jake Dunn, referred to in-game by his fieldname- Nomad. Nomad is armed with various futuristic weapons and equipment, most notably a "Nano Muscle Suit" which, was inspired by the United States' Future Force Warrior 2020 program. 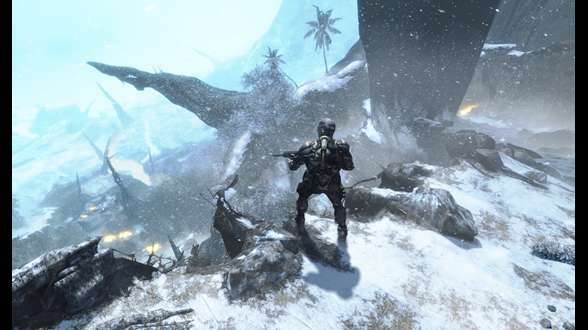 In Crysis, the player fights both North Korean and extraterrestrial enemies, in four different locations: a tropical island jungle, inside an "Ice Sphere" (consisting of the same jungle, but frozen), the alien ship itself (with a zero-gravity area) and an American aircraft carrier. 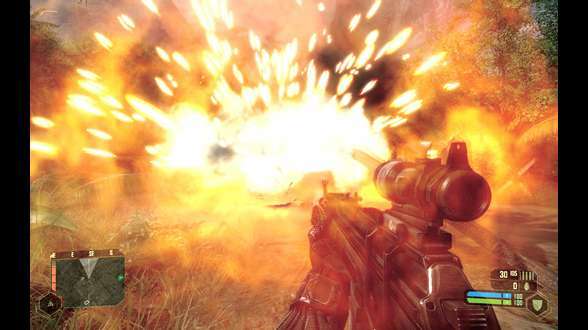 Crysis uses Microsoft's new API, Direct3D 10 (DirectX 10) for graphics rendering, and includes the same editor that was used by Crytek to create the game. Set in 2020, Crysis' plot follows Lieutenant Jake Dunn—codenamed "Nomad"—a United States Army Delta Force operator. As Crysis begins, an American team of archaeologists are taken captive by the North Korean Army, just as they were making an important discovery in the South China Sea. The United States responds by deploying a team of Delta Force Soldiers,—supported by the USS Constitution—who take part in the fighting between the United States and North Korea. Soon, though, it becomes apparent that the North Koreans have large military installations. 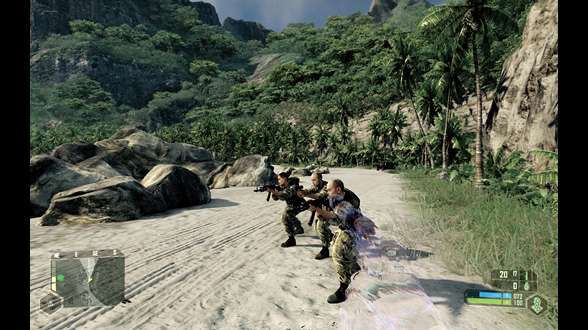 During this phase of the game, the setting is a tropical environment, similar to that in Far Cry, Crytek's previous game. At the end of the first section, the mountain at the center of the island begins to crumble revealing a two-kilometer high alien structure beneath the surface, out of which aliens begin attacking both the US Military and North Koreans. Nomad enters the alien ship in this section and begins to explore the weightless environment, retrieving valuable information about the alien invaders, who periodically attack him. On exiting, the ship xenoforms the area around the island by creating an ice sphere, killing every living thing within it. The final section of the game takes place on the USS Constitution.